One, two, three…Three civil lawsuits have been filed against Casey Anthony! Casey Anthony lawsuits are like first husbands, you always have to throw the first one out. This is how I feel about Zenaida Gonzalez’s pending lawsuit. Considering Judge Lisa Munyon seems to be a no-non-sense judge, I think Morgan & Morgan are going to have to pull some fat furry rabbits out of their hats in order to get a 15K settlement off of Casey Anthony. The M&M’s are going to have to prove damages caused by Casey. The World Awaits, unlike like the judges before her, Judge Munyon is not likely to automatically rule against Anthony in order to gain popularity. On July 6, 2011, one day after Casey Anthony was acquitted, Tim Miller of Texas Equusearch appeared on CNN asking for the opinion of the public as to whether or not to file a lawsuit against Casey Anthony and/or Jose Baez for the return of $100,000 he says he spent searching for Caylee Anthony. He cites Jose Baez’s opening statement, claiming Caylee was never missing as just cause and that Casey Anthony and Jose Baez should reimburse him for money spent and time wasted. Tim Miller has no proof as to when Casey Anthony admitted to Jose Baez that Caylee died in an accidental drowning nor will he ever know since this is client/attorney privilege. Apparently the opinions of the disgruntled masses said yes. 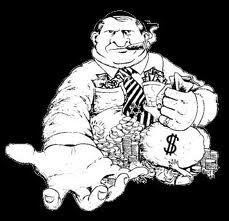 Tim Miller served Casey Anthony while she was still in jail even though FOX 26 legal analyst Chris Tritico thinks that because TES is a volunteer organization that they will not have a right to ask for their money back since they work for free. I say, if Texas Equuasearch were an incorporated profiting business and Casey had paid him 100K to find her daughter, dead or alive, he should reimburse her because Roy Kronk did the job that Tim Miller couldn’t, even with 4200 searchers, 32 of them at the “hot spot” as he called it. Roy Kronk obviously didn’t need a 4 wheeler either. 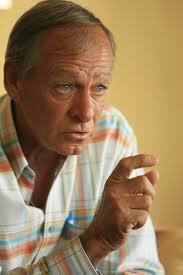 Incidentally, Roy Kronk is suing Leonard Padilla for 15K in a civil suit. Apparently Leonard Padilla let his mouth run a bit too much on the Nancy Grace Show and tweeted some not so nice tweets on Twitter. Personally, I’d prefer for him to sue Nancy Grace since she profited from Leonard Padilla appearances, therefore giving him a platform to spew his speculation and mild mistruths about Roy Kronk. Padilla, whose website lists him as “World Famous Bounty Hunter & Godfather of Bail,” had this to say to Roy Kronk. Padilla, obviously looking for a free trip to Orlando during the lingering national media blitz post acquittal, is said to have asked Kronk and his attorney to pay for his and his attorney’s round-trip airfare to Orlando so he could be served with the legal paperwork directly. Perhaps theJBMission should meet in Orlando to attend the trial. On September 1, 2011, Howard Marks representing his client Roy Kronk filed a lawsuit against the National Enquirer for $15million. Maybe he’ll send us the airfare after he wins this one. In all fairness, Roy Kronk, unlike Padilla did not directly insert himself into this alleged murder. 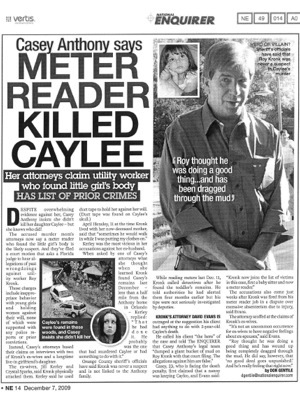 Although he did admit in one of his several interviews with law enforcement that he was interested in finding Caylee Anthony by telling his co-workers, paraphrasing, “I bet she’s in those woods”, what came after was not his fault and the National Enquirer should not have ran this story titled, “Casey Anthony Says Meter Reader Killed Caylee”. I’d like to see how the National Enquirer proves this statement. Now Padilla is suing Anthony and her attorney, Jose Baez, for the cost of those services. The suit asks for about 200-thousand dollars. Padilla claims Anthony and Baez accepted his help looking for Caylee, even when they knew the child was dead. “We feel that we were conned,” Padilla told FOX40 on Monday. I say, Leonard Padilla was never asked by anyone to help in the Anthony case. He directly inserted himself in to the Anthony case as he enjoyed the media fanfare and did he really think that a murder suspect was going to be honest with him? He’s a bail bondsman, he should be used to being lied to. Again, what and when Baez learned of what happened to Caylee will never be revealed to him, client/attorney privilege. In addition, if in a court of law, jurors are asked not to consider an opening statement as truth so why would the same court rule in favor of litigious media pigs who are using it as grounds for a lawsuit? Isn’t an opening statement for a defense lawyer simply a scenario in order to raise reasonable doubt? These opening statements are not arguable as they would be argued and proved during the trials. This is because an effective opening statement establishes the facts of the case and sets forth a legal theory and explanation for why the attorney’s client should prevail which is exactly what the opening statement was in the Anthony case, a theory. As the rest of the world sits back in repugnance, litigious media pigs are still trying to make a pay day off of the death of an innocent child. Enough already! Shout out to the Law Biz!! I have a new found respect for the ones in the law biz. Not just the lawyers, but the ones who make it happen such as the private investigators, researchers and clerical staff of all the law firms of the land. I can imagine a room, similar to telemarketers, making calls, jotting notes, fingers burning up the keys of laptops. Gathering the information is a tedious task but putting it all together takes a brilliant mind, especially in the murder trial of Casey Anthony. The hours it’ll take to put this case together is astounding! Simply stated: I’m in awe. “Thank you” to all in the lawyers who protect our rights and the ones who enforce the laws. In my quest to find the obscure Leonard Padilla statement that I’m so curious about, I came across bits and pieces of transcript of one of the George and Cindy jailhouse visits with Casey. CASEY ANTHONY, MISSING TODDLER`S MOTHER: Yes, but in some ways, I almost feel more protected here than if I were on the outside. CASEY ANTHONY: As long as we have Caylee home, everything else with me we`ll deal with as we can. Lee made a good point. Getting Caylee home is our priority. Everything else will fall into place after that. And that`s the truth. Casey isn’t saying she’s innocent. She’s saying we’ll deal with as we can. Everything else will fall into place after that. They’re offering her an opportunity to talk, and KC is not talking. I find this to be an act of innocence, perhaps. She’s been in jail a month and they are hoping she will talk. She keeps saying she has to keep her mouth shut? Who’s this man that just drops in on the Anthony’s on Caylee’s birthday. Really nice, just wanted to get to know him?? Strange, little tidbit, Did Caylee’s father drop in or a paternal relative? Remember how many times Caylee’s Birthday is mentioned. I’ve never heard of any other Missing Child case where the parents are worried about a birthday. KC thinks this jailhouse video won’t be released. I know in my gut she’s okay. She’s coming home. What can I say to her on the air? What can I tell Zanny? Tell her we forgive her. I just want my baby back. Casey says she’s just as much a victim. Notice how Cindy handles Casey, like she was an 8 year old child caught in a lie. How come she never got to get the car? Is Cindy implying this was the reason Casey dumped the car at Amscot? Cindy interrogates KC. Cindy keeps telling her to look into her eyes. This was a couple of weeks before Caylee’s birthday, AGAIN mentioning Caylee’s birthday?? With all due respect, kidnappers don’t care about birthdays, do they? Well, except in this case, on Caylee’s birthday a nice man “stranger” did drop by the Anthony’s on Caylee’s Birthday. I found it odd that George made a point of telling this to Casey. Notice here; Again Casey doesn’t say she’s completely innocent. It was after this video when the death penalty was taken off. Notice here, how Casey cries so easily when she talks to George. Poor George talks about going into protective custody. Well, that’s all I have for now, folks.